A rotator cuff tear is a common cause of pain and disability among adults. The prevalence of shoulder pain has been estimated to be 7% – 25% and the incidence 10 rotator cuff tears per 1000 people per year (peaking at 25 per 1000 per year among individuals’ ages 42 – 46 years). The overall number of individuals with rotator cuff problems is expected to grow coincident with an aging population that is increasingly active and less willing to accept functional limitations. A large proportion of patients with rotator cuff tears remain asymptomatic. MRI scans of people without shoulder pain revealed partial- and full-thickness rotator cuff tears in 4% of individuals 40 years old and in more than 50% of individuals 60 years old. A torn rotator cuff will weaken your shoulder. This means that many daily activities, like washing/combing your hair or getting dressed, may become painful and difficult to do. In many cases, torn tendons begin by fraying. As the damage progresses, the tendon can completely tear, sometimes with lifting a heavy object or falling on an outstretched hand. Partial Tear: This type of tear damages the soft tissue, but does not completely sever it. Full-Thickness Tear: This type of tear is also called a complete tear. It splits the soft tissue into two pieces. In many cases, tendons tear off where they attach to the head of the humerus. With a full-thickness tear, there is basically a hole in the tendon. Acute Tear: If you fall down on your outstretched arm or lift something too heavy with a sudden jerking motion, you can tear your rotator cuff. This type of tear can occur with other shoulder injuries, such as a broken collarbone or dislocated shoulder. Degenerative Tear: Most tears are the result of a wear and tear of the tendon that occurs slowly over time. This degeneration naturally occurs as we age. Rotator cuff tears are more common in the dominant arm. If you have a degenerative tear in one shoulder, there is a greater risk for a rotator cuff tear in the opposite shoulder -- even if you have no pain in that shoulder. Repetitive stress: Repeating the same shoulder motions again and again can wear your rotator cuff muscles and tendons. Squash, swimming, tennis, rowing, and weightlifting are examples of sports activities that can put you at risk for overuse tears. Many jobs and routine chores can cause overuse tears, as well. Lack of blood supply. As we get older, the blood supply in our rotator cuff tendons becomes less. With a poor blood supply, the body's natural ability to repair tendon damage is impaired. This can ultimately lead to a tendon tear. Bone spurs. As we age, bone spurs (bone overgrowth) often develop on the underside of the acromion bone. When we lift our arms, the spurs rub on the rotator cuff tendon. This condition is called “shoulder impingement”, and over time will weaken the tendon and make it more likely to tear. Most rotator cuff tears are largely caused by the normal wear and tear that goes along with aging, therefore people over 40 are at greater risk. People who do repetitive lifting or overhead activities are also at risk for rotator cuff tears. Overhead athletes are especially vulnerable to overuse tears, particularly tennis players and swimmers. Painters, carpenters, and others who do overhead work also have a greater chance for tears. Acute tears, such as from a fall, usually cause intense pain. There may be a snapping sensation and immediate weakness in your upper arm. Tears that develop slowly due to overuse will also cause pain and arm weakness. 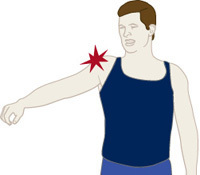 You may have pain in the shoulder when you lift your arm to the side, or pain that moves down your arm. At first, the pain may be mild and only present when lifting your arm over your head, such as reaching into a cupboard. Over-the-counter medication, such as aspirin or ibuprofen, may relieve the pain at first. Your doctor will also examine your neck to make sure that the pain is not coming from a “pinched nerve” and to rule out other conditions, such as arthritis. X-rays: X-rays shows the bones of the shoulder but do not show the soft tissues of your shoulder like the rotator cuff. X-rays of a shoulder with rotator cuff pain are usually normal or may show a small bone spur. 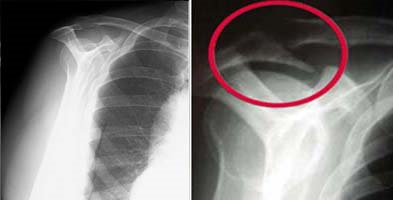 A special x-ray view, called an "outlet view," sometimes will show a small bone spur on the front edge of the acromion. Ultrasound and Magnetic resonance imaging (MRI): These studies create better images of soft tissues like the rotator cuff tendons, ligaments and muscles. They can show fluid or inflammation in the bursa and rotator cuff. In some cases a partial tear of the rotator cuff may be seen. 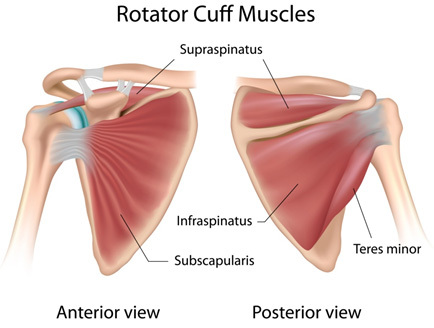 They can show the rotator cuff tear, as well as where the tear is located within the tendon and the size of the tear. An MRI can also give your doctor a better idea of how "old" or "new" a tear is because it can show the quality of the rotator cuff muscles. (Left) Normal outlet view x-ray. (Right) Abnormal outlet view showing a large bone spur causing impingement on the rotator cuff. Important: If you have a rotator cuff tear and you keep using it despite increasing pain, you may cause further damage. A rotator cuff tear can get larger over time. Chronic shoulder and arm pain are good reasons to see your doctor. Early treatment can prevent your symptoms from getting worse. It will also get you back to your normal routine that much quicker. Your pain does not improve with nonsurgical methods. Continued pain is the main indication for surgery. If you are very active and use your arms for overhead work or sports, your doctor may also suggest surgery. There are a few options for repairing rotator cuff tears. Your orthopaedic surgeon will discuss with you the best procedure to meet your individual health needs. 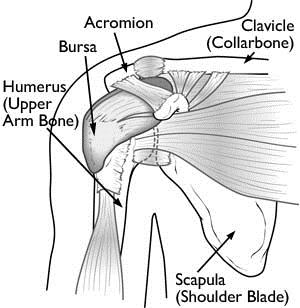 Surgery to repair a torn rotator cuff involves re-attaching the tendon to the head of humerus. A partial tear, however, may need only a trimming or smoothing procedure called a debridement. A complete tear within the thickest part of the tendon is repaired by stitching the two sides back together. Dr van den Berg does most of his rotator cuff repairs arthroscopically which leads to less pain, shorter hospital stay and the ability to address all underlying conditions of the shoulder with minimal soft tissue damage. Because the arthroscope and surgical instruments are thin, your surgeon can use very small incisions (cuts), rather than the larger incision needed for standard, open surgery. All-arthroscopic repair is the least invasive method to repair a torn rotator cuff. 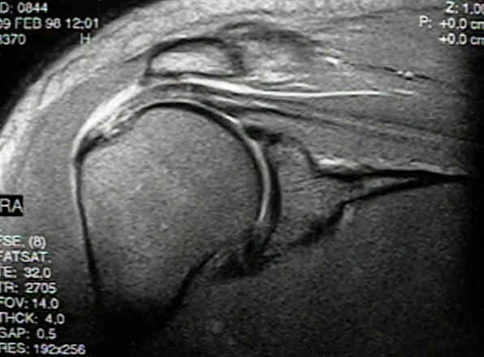 (Left) An arthroscopic view of a healthy shoulder joint. (Center) In this image of a rotator cuff tear, a large gap can be seen between the edge of the rotator cuff tendon and the humeral head. (Right) The tendon has been re-attached to the humeral head with sutures. Surgery is performed to suture the torn tendon ends to the bone. During surgery, Dr. van den Berg also will remove any inflamed bursa or bone spurs that would delay tendon healing. You will receive a general anaesthesia and an injection of a local anaesthetic around the nerve that goes to the shoulder. This lasts 4-24 hours and will help decrease your pain after the surgery. Following surgery you will awaken in the recovery room with your arm in a sling. You will remain in the recovery room for 30-40 minutes until fully awake and will stay overnight in the hospital to ensure no medical problems develop. Most patients go home the next morning. 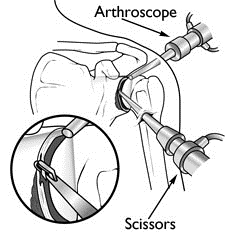 During shoulder arthroscopy, a small camera, called an arthroscope, is inserted near the shoulder joint through a small (usually 5-10mm) incision. The arthroscope is attached to a video monitor to allow Dr. Van den Berg to look inside your joint. Instead of making a large incision, Dr. Van den Berg uses three small (5-10mm) incisions. Through one incision, he inserts the arthroscope to look inside your shoulder. He inserts special instruments that allow the removal of scar tissue and bone through the other two incisions. Dr. Van den Berg will then insert small plastic/metal screws (called “suture-anchors”) into the shoulder. 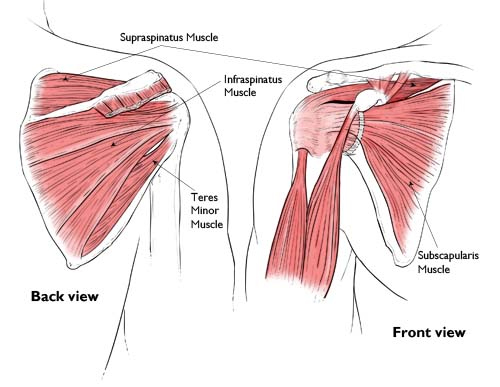 (Left) The rotator cuff muscles and their tendons. 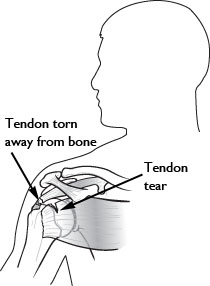 (Right) Typical location for a rotator cuff tendon tear. (Left) The suture anchors are inside the bone. The green and white sutures are ready for the repair. (Right) The sutures have been placed through the torn tendon. The sutures hold the tendon in position while it heals to bone. The operation normally takes between 60 to 90 minutes. Doctor’s Visits: Your first post-operative visit is 2 weeks after surgery so that Dr. Van den Berg can examine the surgical incision. He will give you additional instructions for exercises, show you some pictures and videos taken during surgery (you are welcome to bring a USB Memory Stick for a copy of the pictures and videos) and discuss your allowed activity level. You will need to wear a sling full-time for 6 weeks. During this time, you can come out of the sling three times a day to do your physiotherapy exercises. You are not to raise your arm without help for six weeks after surgery. This allows the tendon to heal in the best possible position. Returning to Work: For most sedentary jobs, Dr. Van den Berg recommends taking 2 weeks off from work. When you return to work your arm will be in a sling (for 6 weeks after surgery), but you should be able to manage as long as you do no lifting, pushing, pulling or carrying. You may begin light duty work involving no lifting, pushing, pulling or carrying, within two weeks after surgery; you may work at waist/desk level. Most patients can tolerate occasional work at shoulder level 3-6 months after surgery, but a return to heavy lifting or overhead use may require 6-12 months. Infection can require antibiotic treatment with pills or by injection. Rarely, surgery is necessary. The need for repeated surgery because tendons do not heal properly or tear again. Bone infection or fracture (rare). Failure to achieve the desired result is not strictly a complication but it can be a source of disappointment. This operation may result in incomplete motion, strength or function. Nerve injury is extremely rare but may result in temporary or permanent, partial or complete loss of feeling and/or movement in the arm. Reflex sympathetic dystrophy (rare). Also called complex regional pain syndrome, is an unusual neurological disease in which the nervous system malfunctions after a traumatic event, such as an accident, a fall, surgery, or even after a minor injury such as a sprain. This malfunction causes pain that may seem severe compared to the original injury and may remain long after the injury has healed. Skin sensitivity, excessive sweating, numbness, and tingling may also occur with reflex sympathetic dystrophy. This condition is not understood well and is difficult to diagnose and treat. Physiotherapy plays a vital role in getting you back to your daily activities. A personalized physiotherapy program will help you regain shoulder strength and motion. You will be referred to a dedicated shoulder physiotherapist with years of experience in treating all kinds of shoulder problems. After surgery, therapy progresses in stages. At first, the repair needs to be protected while the tendon heals. To keep your arm from moving, you will most likely use a sling and avoid using your arm for the first 6 weeks. How long you require a sling depends upon the severity of your injury. Even though your tear has been repaired, the muscles around your arm remain weak. Once your surgeon decides it is safe for you to move your arm and shoulder, a therapist will help you with passive exercises to improve range of motion in your shoulder. With passive exercise, your therapist supports your arm and moves it in different positions. In most cases, passive exercise is begun within the first 6 weeks after surgery. After 6 weeks, you will progress to doing active exercises with the help of your physiotherapist. At 8 to 12 weeks, your therapist will start you on a strengthening exercise program. Expect a complete recovery to take several months. Most patients have a functional range of motion and adequate strength by 4 to 6 months after surgery. Although it is a slow process, your commitment to rehabilitation is key to a successful outcome. Full recovery may take up to a year but results and outcomes are generally good or excellent. Surgery to repair a torn rotator cuff is almost always successful in alleviating shoulder pain. Returning strength to the shoulder is more difficult to guarantee. This type of surgery is successful about 85-95% of the time. No shoulder operation is 100% successful in every individual but the procedures we perform are reliable and will help restore the potential function in your shoulder. Rotator cuff repair for a tear from a acute injury works best if it is done within a few weeks of the injury. Because of the many variables involved, I can make no guarantees other than to assure you I will deliver the very best medical care possible. Very large tears [greater than 2 in. (5 cm) or involving more than one rotator cuff tendon] often cannot be repaired. Grafting and patching procedures are possible, but they are not much better at restoring strength than debridement and smoothing, which are less risky and require less rehabilitation. Less active people (usually those older than 60) with confirmed rotator cuff tears that do not cause pain, significant weakness, or sleep problems can safely go without surgery unless symptoms get worse. Some people who do not have surgery to repair severe rotator cuff tears develop cuff tear arthropathy, a condition of progressive arthritis, pain, and significant loss of strength, flexibility, and function. In some cases, arthroscopic debridement and smoothing adequately relieves pain and restores enough function to allow daily activities, and open surgery is not necessary. Dissolvable Anchors: Many orthopaedic surgeons have begun to use dissolvable anchors. Anchors hold stitches in place in the bone until the repair has healed. Dissolvable anchors are gradually absorbed by the body. 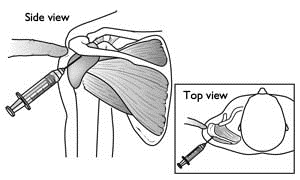 Arthroscopic Techniques: Future developments in the treatment of rotator cuff disease include newer arthroscopic surgical techniques. These allow more secure repairs that may improve the rate of tendon healing. Orthobiologics: One of the most exciting areas of research is orthobiologics. These are tissue grafts and injections that promote growth of new tissue in the body and foster healing.